The first thing I see as I set my eyes on the artwork closest to the door is my own body reflected. 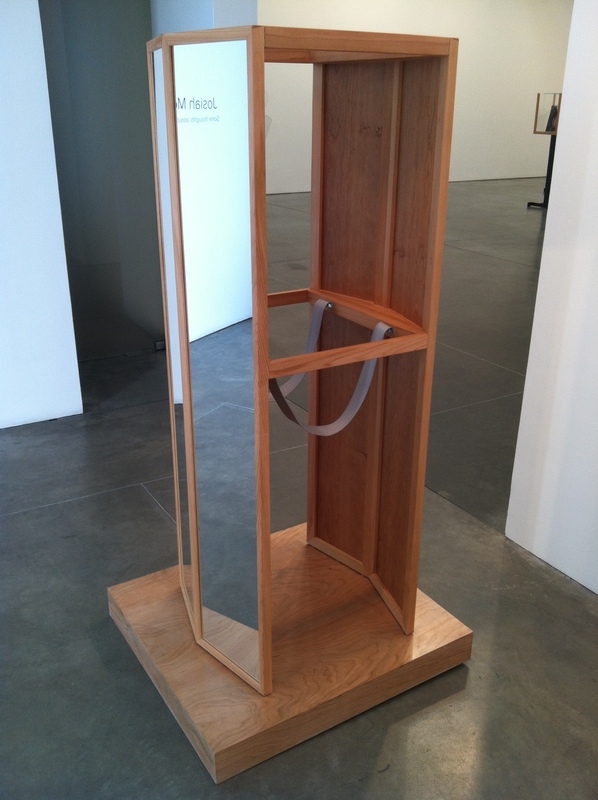 It’s a mirrored sculpture—there are two actually—and as I circumnavigate them I notice each is outfitted with shoulder straps on the inside. They are evidently meant to be worn, somewhat like a sandwich board, except the contraption is made in such a way that whoever put it on wouldn’t be able to see where they were going. Notice the thin line on the ground. It runs a circuitous route through the gallery starting and ending at the base of these body sculptures. This must be how the wearer navigates the room, with eyes on the ground. 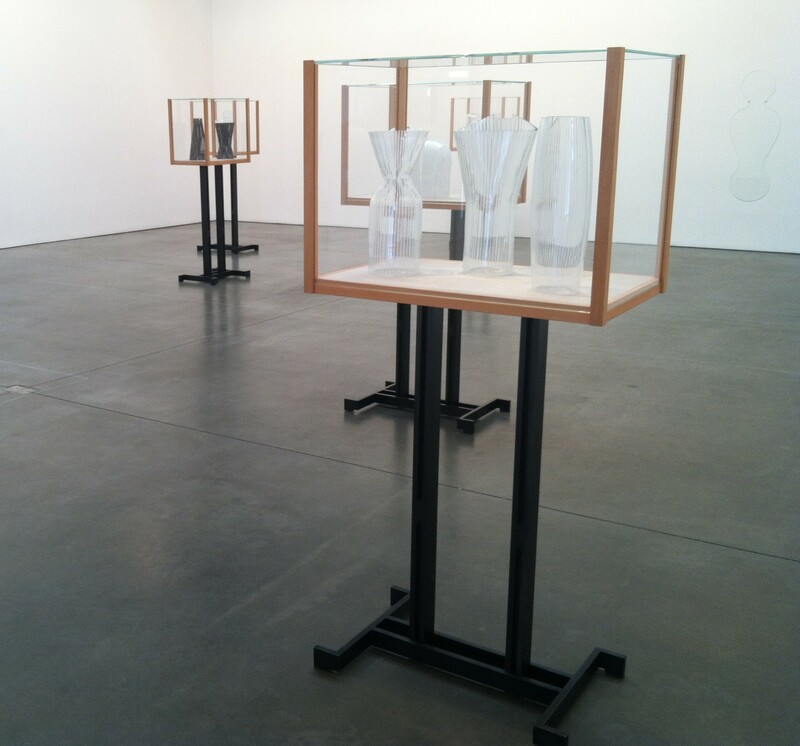 I proceed on the line and pass by eight freestanding display cases each housing two, three, or five glass objects. 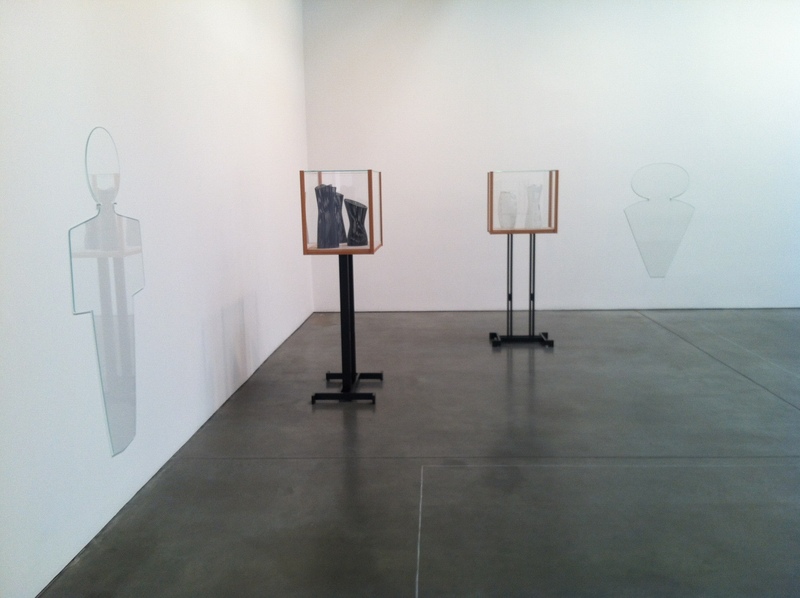 The edges of the display cases look to be made of the same wood as the wearable sculptures, and the glass of which the cases’ faces are made seems consistent with the quarter-inch sheets of glass pegged to the walls, which have been cut into simplified bodily forms like stylized foosball figurines. Are the objects in the cases vases? No, clearly not—they all have open bottoms and a number have holes and notches cut into them. Vertical bands in black, white, grey, and brown, stripe each object and establish a hypnotic optical effect when I move around them, which I do several times, nearly inducing a space out. I snap to being present when it occurs to me that my orbit could be compared to that of a celestial body. I’m behaving like a moon. I lean against a wall, mimicking the foosball figurines whose backs I imagine are also up against the walls. Contact is key and if you can touch something with your eyes why not enter it with your mind? Here then I travel inside one of McElheny’s neat vitrines with its beige linen floor and I peer out from the interior of one of these stripped objects. A penetration? Well yes, of sorts, but if you consider it sexually (and how can you not?) then the question is what’s born of the engagement? The work is more cunning than I. It reveals itself as an inverted scenario. It is not I that have entered the work, but the work that has entered me, occupied space in my personal think box. I’m the one penetrated. This entry was posted in Chelsea and tagged Andrea Rosen, Josiah McElheny by Chuck Post. Bookmark the permalink.